A panel organized in Moscow by the Presidency of the Republic of Turkey's Directorate of Communications has discussed the relationship between Turkey and Russia and regional developments, the Directorate said Thursday. In a statement, the Directorate said that officials from the Kremlin's Directorate of Communications and Public Feedback were among the attendees. The panel, titled "Turkey-Russia relations during the Syria process," is part of the new edition of the "Turkey Today" panels, previously held in New York, Berlin, Buenos Aires, London, Beijing and Shanghai. Valdai Discussion Club Program Director Ivan Timofeev moderated the panel. Hasan Basri Yalçın, an academic at Istanbul Trade University's Political Science and International Relations Department and strategical research director at Foundation for Political, Economic and Social Research (SETA); Enes Bayraklı, an academic in the Political Science and International Relations department at the Turkish-German University; and Hüseyin Alptekin, an academic at Istanbul Şehir University's Political Science and International Relations Department joined the panel as speakers. 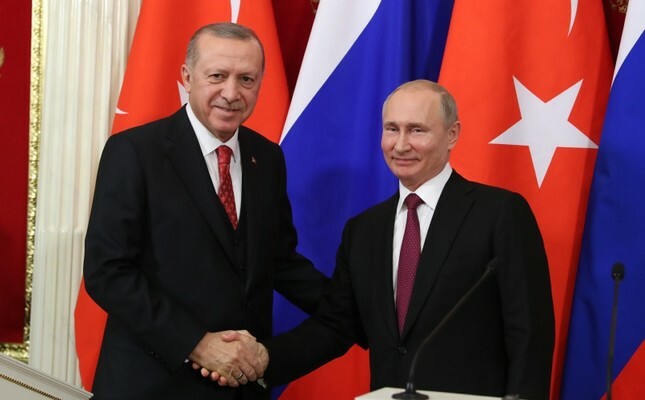 During the event, Turkish-Russian bilateral relations were discussed, particularly noting that in spite of tensions that arose due to the downed jet crisis and Ambassador Andrey Karlov's assasination in Ankara, relations between the neighbors have endured hardships and mended. The strategic importance of Turkish-Russian relations, and developments and peace efforts in Syria were also discussed. The panel underlined that although Turkey and Russia hold diverse views in a number of policy areas, both countries are dedicated to continue coordinating policies in the region, and are optimistic that bilateral relations will further strengthen in the future. Panel speaker Yalçın reiterated that the globally recognized terrorist group PKK's Syrian affiliate Democratic Union Party (PYD) and its armed branch People's Protection Units (YPG) are not only a threat for Turkey but for the whole region. He reiterated that Turkey will fight YPG terror to the end. Yalçın said Turkey's foremost sensitivity is Syria's territorial integrity, adding that stability in northern Syria will be impossible if a "terror corridor" consisting of vast swathes of territory controlled by YPG is allowed to exist. Also speaking on the panel, Bayraklı said that Turkish-Russian cooperation will benefit Europe and will prevent a possible influx of migrants to European Union countries. Bayraklı reiterated that Turkey has no problem whatsoever with the Kurds and sees them as brothers. He said Ankara only recognizes PKK and YPG members as terrorists, regardless of their ethnicities, adding that the terrorist group's efforts to form an autonomous region on the Turkish border will have negative consequences for the region, including Iraq, Syria and Iran. Alptekin also touched upon the dangers posed by the PYD and YPG. He listed three incorrect understandings of the group that have been propagated to the public over time, namely the equating of the YPG with the Kurds, the idea that the YPG is the only threat in Syria and the fallacy that it is too late to fight the YPG. The panel also hosted Turkey's Moscow Ambassador Mehmet Samsar, Deputy Chief of the Kremlin's Directorate of Communications and Public Feedback Oleg Tsatsourine and his senior adviser Tatiana Mazanova, Valdai Discussion Club CEO Andrey Bystritskiy, and officials from Russian Foreign Relations Council and Russian Foreign Ministry's Turkey and Syria Department.